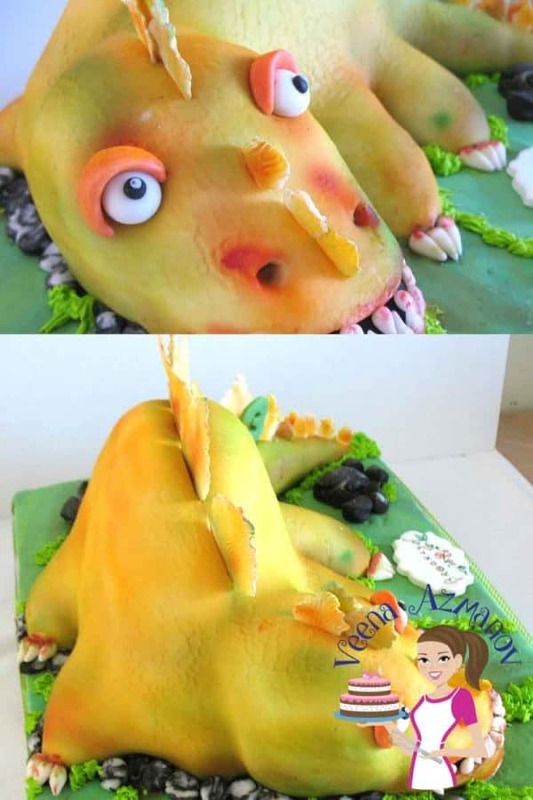 A Dinosaur Cake is great for a kids birthday. This was made for a 5 year old boy who loves Dinosaurs. 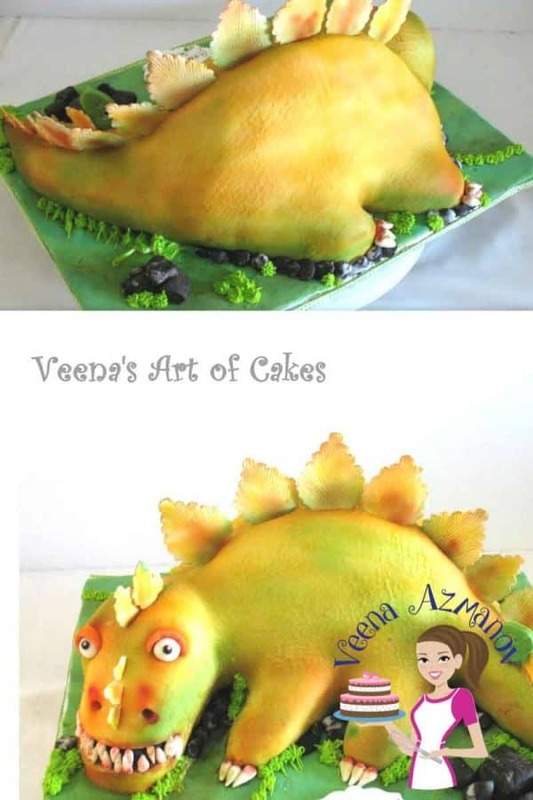 In this video I share all details of how I made this Dinosaur cake. I hope you find it useful. The cake inside is a Devil’s food chocolate cake with Velvet American Buttercream and homemade Sugar paste. But if you are new to carving then I would prefer that you use my Dense Chocolate Cake perfect for carving. I had Dinosaur cake on the wish list of requested tutorials so obviously I decided to video the whole process. I wanted to make a time lapse version so you could see quickly how the whole cake is done but by popular demand I had to make a slow version too. Some of the fans on Facebook said they would prefer a slow detailed version. So I ended up making both the quick and slow version. I had a few questions after I posted the video so here’s just a little more info. This may be useful when you are actually making the cake. a single lager 1 x 6 inch round cake. Cut both the 9 inch rounds into two – dividing at 3/4 and 1/4 as shown in the video. The 2x 1/4 in again divided into 2 length ways. The curved part of the 1/4 is used for the tail. The two spare strips of the 1/4 inch are cut again into two each to make four legs. For the head – I cut the 6 inch round into three and stacked as shown. Carved further to make the head. The tail and belly are built up with spare cake. If you do not have a texture mat take a round open nozzle like a tip 5 and mark them all over overlapping the rounds as you go. This will also give a good Dinosaur skin effect. if you want to make an yellow Dinosaur – cover the cake and make the Spikes with Yellow then use orange petal dust and a dry thick pain brush to add details. 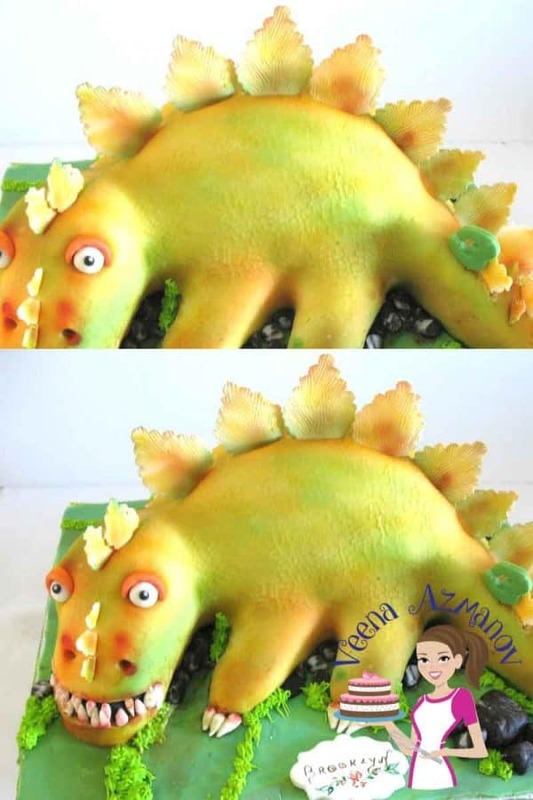 If you want to make a Green Dinosaur – Cover the cake and make the spike in light green. Then use Yellow and Dark green Petal dust and a dry thick paint brush to add details. The stones are made by marbling black and white or even some brown sugar paste and then cutting them into uneven shapes. To decorate the board you could pipe Royal Icing grass every where or just use a mix of brown and white sugar to simulate sand. Another alternative could be to color coconut flakes with green and spread them for grass. I hope you find the videos and my write up useful. If you do attempt this cake please do share it with me on my Facebook page. It’s always nice to see your creations made with my tutorials. 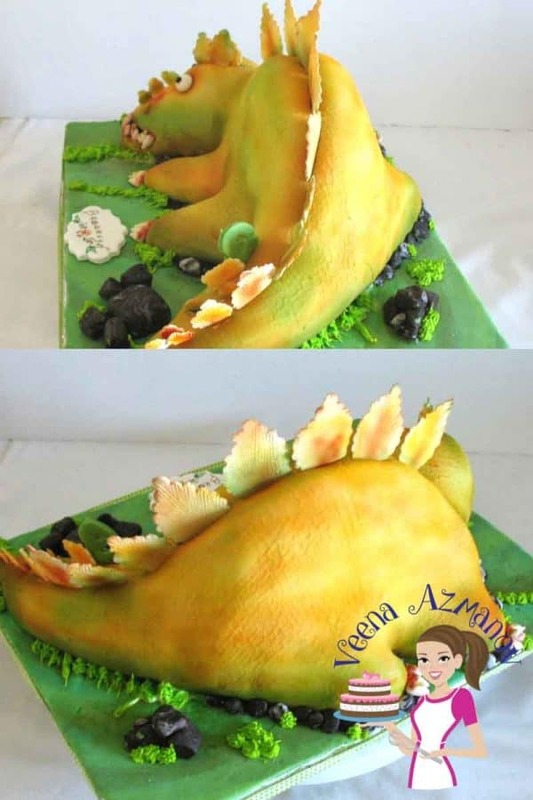 I love this dinosaur cake. What size cake board did you use please? I would like to make it for my nephews 1st birthday. I cannot remember the exact size but I remember it being pretty large and yet I wish I had more space – I think it was 20 inches on one side the other was a bit shorter.